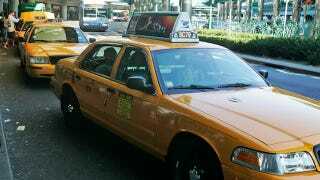 Some New York cabbies have earned an important measure of control over their livelihoods: they no longer have to drive around ads for strip clubs if they don't want to. The Times reports on the new regulation, which affects drivers who own their cabs but lease the medallions that allow them to operate in the city. The medallion owners have historically been able to choose the advertising that goes on top of the cab — and they also pocket the ad revenues. But now, vehicle owners will be able to reject ads they "reasonably" feel are inappropriate. Example: the FlashDancers ad that made driver Mohan Singh's six-year-old granddaughter proclaim, "I want to be a FlashDancer." "Conscience clauses" have (deservedly) gotten a bad name in liberal circles due to their association with pharmacists who don't want to give out emergency contraception. But in those cases, pharmacists are refusing to do an integral part of their jobs. Cabdrivers, meanwhile, are merely asking for the right to have a little control over ads that "the driver carries, literally, on his back" — and that have nothing to do with the actual service the drivers provide. This is a case where it makes perfect sense for people to be able to assert their beliefs and values in their place of work. And Singh's concern for his granddaughter is a nice reminder that cab drivers — with whom many New Yorkers' interactions are brief, impersonal, and sometimes adversarial — are people with real families and real concerns.